What do you do when you and your whole team have to travel to a rival baseball field? How do you keep looking confident even when you’re scared to go out and play against other teams who are pitching at home? There are tons of ways you can keep your cool even when traveling, but sporing matching sublimated baseball button jerseys is a great first step. There are tons of advantages to wearing your very own team-coordinated sublimated baseball uniforms. For starters, they instantly give you a more professional and polished look. This is something your average, run-of-the-mill cheaply made baseball uniform can’t give you. Nothing screams “We’re dedicated players and we’ve come here to beat you” than sublimated baseball full button jerseys that look just like the ones the professionals wear. Plenty of amateur teams have ordered their matching sublimated baseball uniforms from us here at SSU. No matter what kind of team you’re a part of (all-girls, all-boys, mixed) or what age you and your teammates are, we have the perfect attire for you. From high-school-level teams to younger teams, what’s important is that everyone has fun playing the sport and has a blast wearing their custom-made ensembles. 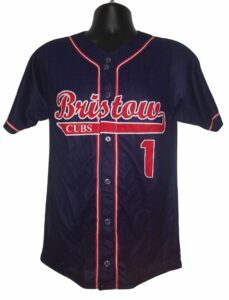 We even sell Little League baseball uniforms! This specific jersey is one of the top-selling items on our website — and for good reason! Besides the material allowing your skin to breathe and it feeling lightweight, you also get complete creative freedom. We want every team to have the jerseys of their dreams, which is why we let you take charge of the creative process. Send us your design for the jerseys (don’t forget to include your school/team’s colors, logo, and even motto) and our design team will get in touch with you. It couldn’t be more fun and simple process!